THE LAST naturally occurring case of smallpox was diagnosed in 1977 and the World Health Organisation certified the global eradication of the disease in 1980. Back in the 18th Century, an estimated 400,000 people per year died from smallpox across Europe. Thanks to the greats of medicine – notably Edward Jenner, who discovered in 1798 that vaccination could prevent the disease – it was eventually tamed. And so by 1847, of the 3697 patients treated in Dundee Infirmary, 1200 were for typhus fever, 1800 suffered from epidemic fevers – but only 27 were under doctor’s orders for smallpox. 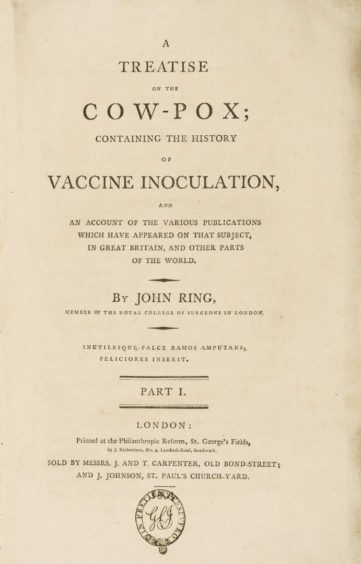 On March 22, London saleroom Forum Auctions sold a copy of John Ring’s first edition of A Treatise on the Cow-Pox; containing the History of Vaccine Inoculation. Published in two volumes between 1801-1803, the work is rare, with no copy seen at auction since 1972. Moreover, this was a presentation set from the author to the Rev George Charles Jenner, inscribed ‘Revd. Mr. Jenner from the Author.’ Mr Jenner was Edward Jenner’s nephew. Somerset-born Ring practised in London from 1774. An attack on cow-pox treatment made by Benjamin Moseley, physician to the Chelsea Hospital, brought from Ring a refutation. Then, in August 1799, he met Edward Jenner, and they became friends. 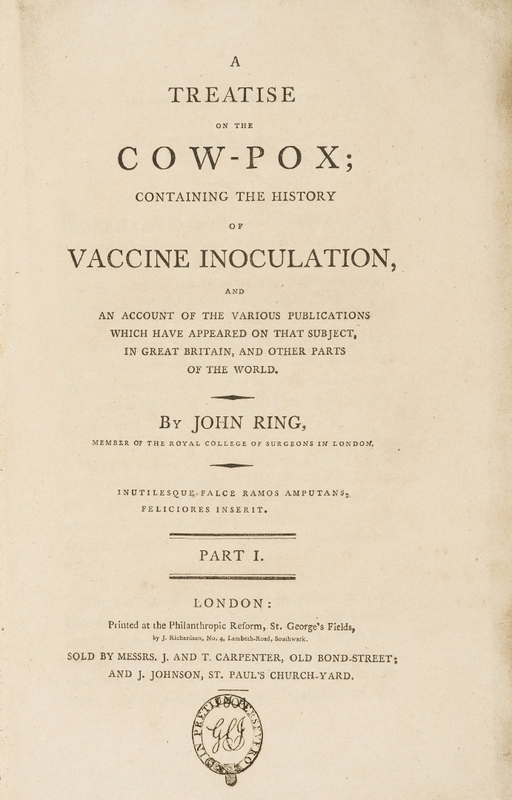 From 1799 Ring devoted most of his professional life to the cause of vaccination. 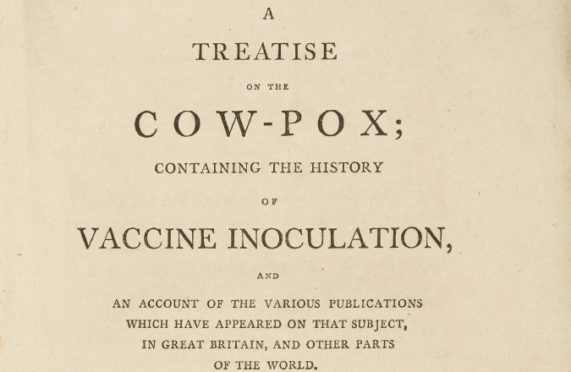 He had leading medical men in London sign a document acknowledging that cow-pox was a much milder and safer disease than inoculated smallpox. The British Vaccine Establishment was founded in 1809. Edward Jenner was appointed the first director, and he nominated Ring to act as his principal vaccinator. Ring was overlooked for the post, however, and Jenner resigned in the huff! The hammer price was £2400.